Under Sabella -- nicknamed El Mago ("the magician") Argentina have developed into a formidable side that is again punching its weight. SAO PAULO: When Alejandro Sabella was handed the task of reviving Argentina's fortunes after a poor campaign at the 2011 Copa America, not everyone in his homeland was convinced he was the right man. "I don't know why they chose him," said the country's legendary 1978 World Cup-winning coach Cesar Menotti. "I don't know what his project is." Three years later, and Sabella's appointment is starting to look like a stroke of genius by his bosses at the Argentina FA as they prepare for their first World Cup semi-final since 1990. Under Sabella -- nicknamed El Mago ("the magician") during his playing days -- Argentina have developed into a formidable side that is again punching its weight. They may have won all their matches by just one goal margins but they have shown a mental strength that was singularly lacking four years ago under the unpredictable Diego Maradona. Some have queried if the team relies too much on four-time world footballer of the year Lionel Messi but if that is the case it only goes to prove that Sabella took the right decision when he took over at the helm by swiftly installing him as captain. 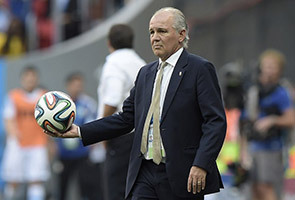 Unlike some of his predecessors Sabella has not hesitated to tailor his team in order to make the most of the four-time World Player of the Year's talents. The results have been spectacular, with Messi for the first time consistently producing his sparkling Barcelona form in Argentina's famous colours, with four goals alone at the finals. "He's the water in the desert. He finds solutions when we think there aren't any," Sabella commented after the 1-0 win over Belgium in Saturday's quarter-final. Sabella's rise to the top job in Argentinian football was a long time in the making. He worked as an assistant to Daniel Passarella for several years, part of the Argentina coaching staff at the 1998 World Cup. However it was not until Sabella was appointed Estudiantes manager in early 2009 that his coaching career took off. Within months he had guided them to the Copa Libertadores title, and followed up that success by taking the 2010 Apertura championship -- effectively making him a shoo-in for the Argentina job in 2011.